I always thought that the only way to make Char Siu is to cook it under an oven grill. (Oops, am I the only one???!!) I have been using this method of cooking for a long time till I discover the “Wok” style. 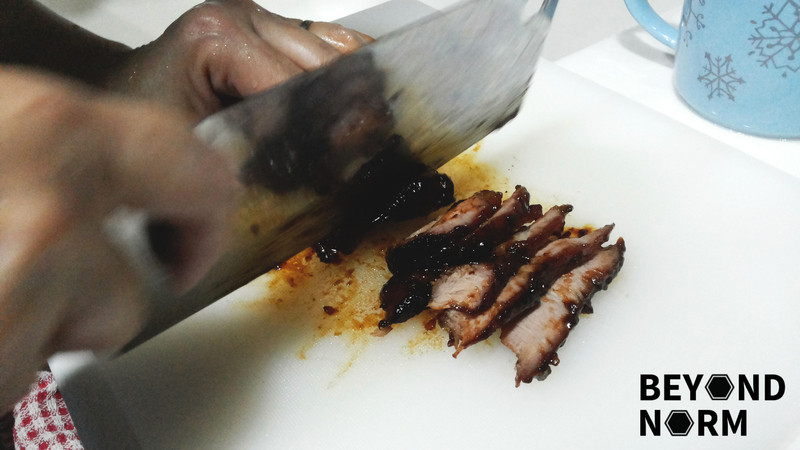 This method of cooking brought much joy to me as the Char Siu turn out to be moist and tender and it tasted as good as the grilled ones. Typically Char Siu is consumed alongside other meat dishes such as chicken, roast pork or roast duck or an independent lunch item on a per-person basis in a “rice box” meal. Personally, when I make Char Siu, I will also make some roast pork (Siu Yok) to pair off with. I would also prefer to serve these dishes with the chicken rice instead of plain rice and a plate of green vegetables with garlic oyster sauce. Yummy, yummy in my tummy!! Cut meat into long strips, about 3 – 4 cm thick, and rub some salt all over the meat. Set aside for 5 minutes. Then rinse the salt off and set aside in a bowl. In another bowl add all the ingredients for marinade and mix well. 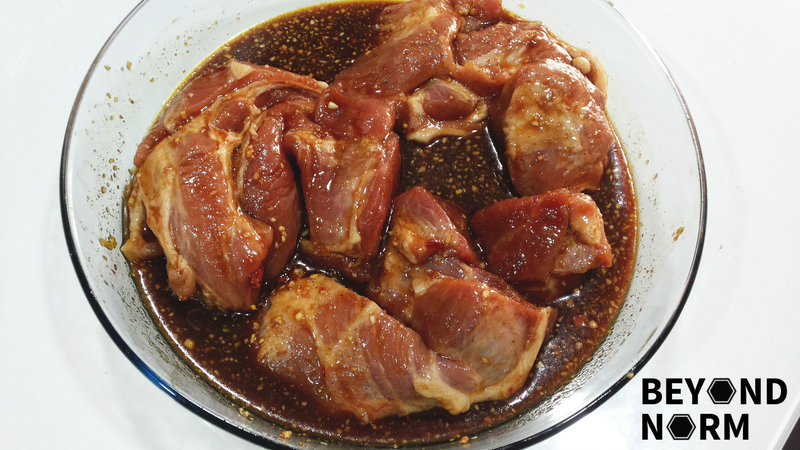 Transfer the meat in its marinade to an air tight container or Ziploc bag. Then put it into the refrigerator for at least 5 to 6 hours but preferably overnight. 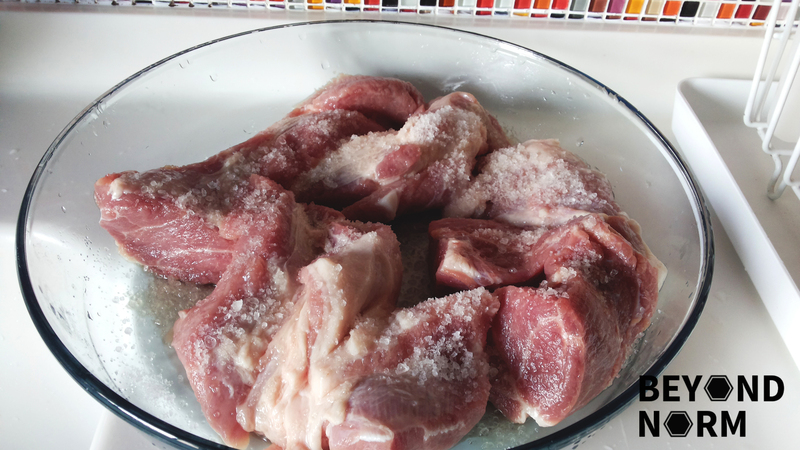 An hour before cooking, remove meat from the refrigerator. Heat wok and then transfer the meat and all the marinade into it. Simmer on low heat for about 45 minutes or more, depending on how tender you like the meat to be. 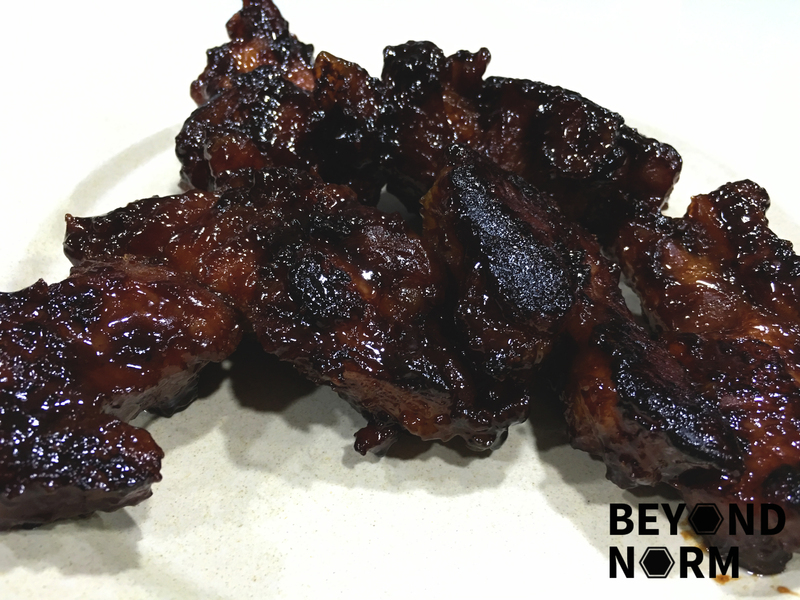 Remember to turn the meat once in a while and add some water if the sauce is drying up and your meat is still tough. After 45 minutes, grab a pair of cooking scissors and snip off some parts and test whether it is tender enough for you. 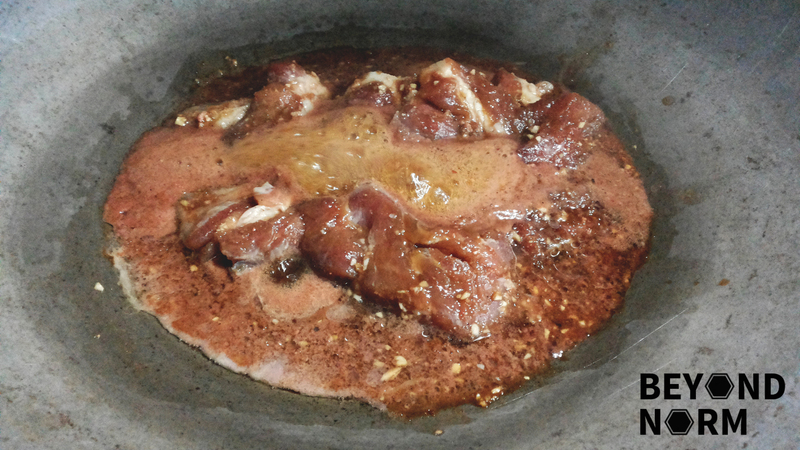 Once meat is tender enough, remove most of the sauce into another pot. Remove from heat and glaze with some honey. Let it rest for 30 minutes. For the sauce, adjust the taste, i.e. too salty, add sugar, too sweet, add some salt. Sieve the sauce into a bowl for a smooth finish. Personally, I prefer to use golden syrup instead of honey because I find that golden syrup blends the different flavours of the meat better. The above seasoning quantities are a guide and you may vary according to your taste. You just need to ensure that there’s a balance of sweetness and saltiness. We tried this yesterday and loved it! Will definitely cook again. Hi, can I omit the minced garlic?